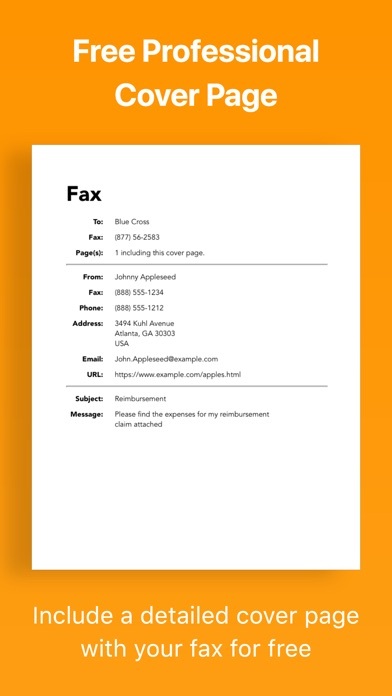 JotNot Fax is the easiest, most reliable, and fastest way to send faxes. Save time and money with JotNot by skipping the fax store. JotNot Fax comes with a built-in scanner, so you don't need to find a scanner or fax machine if you have a paper document. 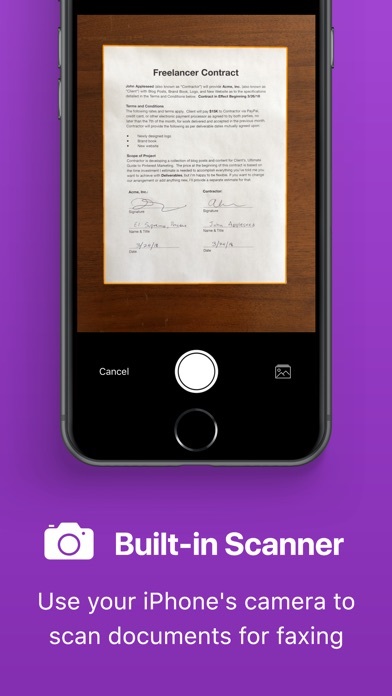 Just scan in the document with your phone's camera, enter the fax number, and hit send. 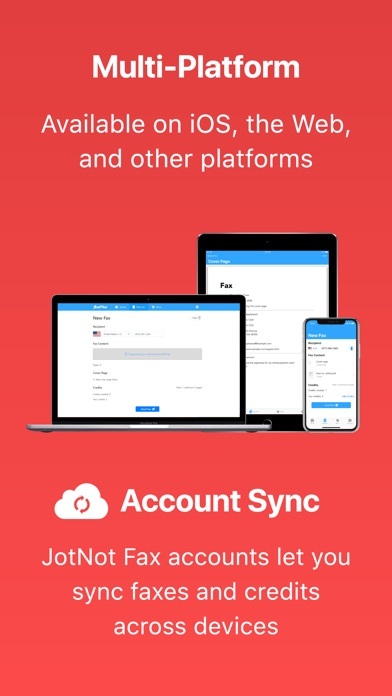 Create a free JotNot account to sync faxes and credits across multiple devices and other platforms, including iOS, the Web, and more. 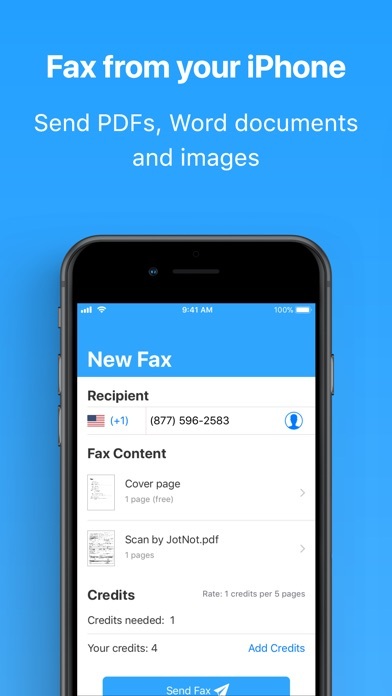 JotNot Fax will send you a push notification when your fax completes. JotNot Fax also gives you a proof of transmission for each successful fax. It includes support for common file types, including PDF, docx, and images. Other benefits include: - Send faxes from your iPhone while out of the office - Built-in, free cover pages give a polished first impression - Stay organized and keep track of your faxes - Fax any document (from email attachments, the cloud, or other apps) Fax Pricing: We charge credits for every fax you send. Faxes cost 1 credit for every 5 pages. For example: - a fax with 1-5 pages costs 1 credit - a fax with 6-10 pages costs 2 credits - a fax with 11-16 pages costs 3 credits, and so on The fax cover page is free -- it does not count towards the page count for the purposes of calculating the credits needed for a fax. You can purchase credits in packs within the app. We offer packs of 3, 10, 20, and 100 credits; larger packs offer cheaper pricing per credit. See the app for local pricing. 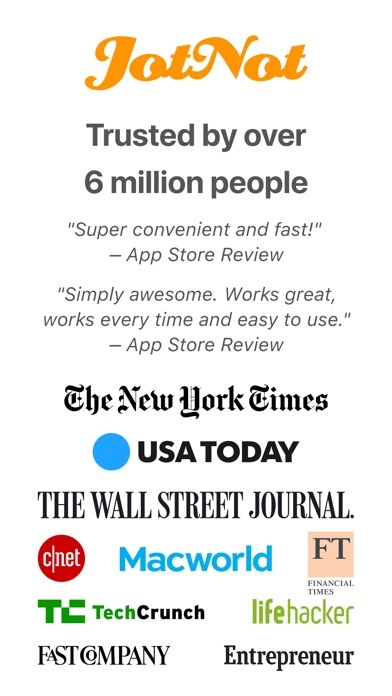 This app does not require a subscription. 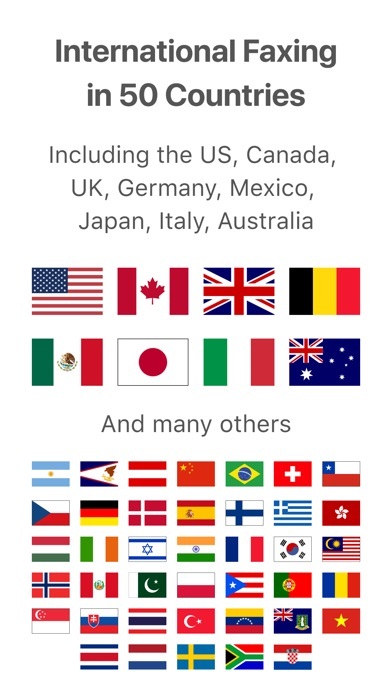 JotNot Fax supports sending faxes to these countries and regions: United States, Canada, United Kingdom, Germany, Mexico, Japan, Italy, Australia, American Samoa, Argentina, Austria, Belgium, Brazil, Chile, China, Costa Rica, Croatia, Czech Republic, Denmark, Finland, France, Greece, Guam, Hong Kong, Hungary, India, Ireland, Israel, Malaysia, Netherlands, Norway, Pakistan, Peru, Poland, Portugal, Puerto Rico, Romania, Singapore, Slovakia, South Africa, South Korea, Spain, Sweden, Switzerland, Taiwan, Thailand, Turkey, U.S. Virgin Islands, Venezuela, Vietnam. If you have any issues or suggestions please email us at support@jotnot.com (you can even do it from within the app) and we will get back to you shortly. Always reliable- fast - easy. 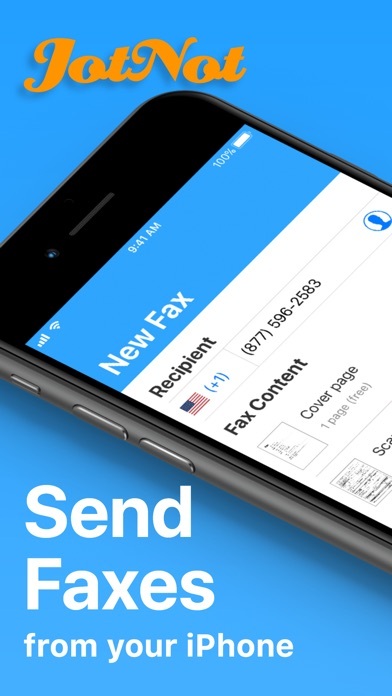 I’ve used this app a couple of times to send faxes and have had no problem in doing so. My faxes have gone through and been received with no issues. Great way to scan and email or fax. I use Jot Not most every day. Really needed to send my medical records that I had on my person to a new doctor’s but they wouldn’t accept emails from those that weren’t care providers. My options were to stop by in person or send them via fax. 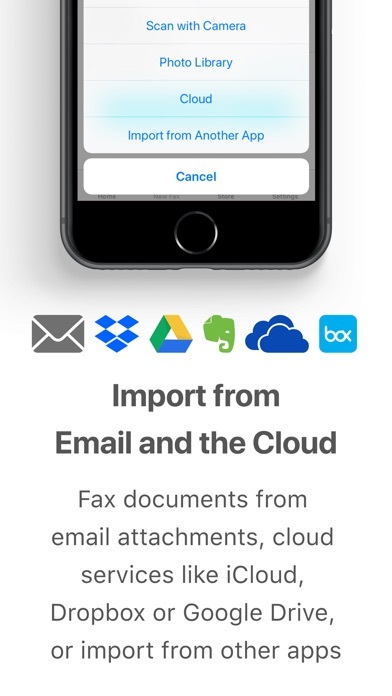 This app came in handy since I didn’t know anybody with a fax and had no way of getting to an Office Depot at that very moment. Scanned my docs and cover photo onto my Mac, dropped them in the cloud, uploaded them on JotNot and off they went! Docs office accepted them, no questions asked! Complete life saver! I’m impressed. This app has all of the features I want, need, with extra features. Sending a fax is inexpensive and quick. 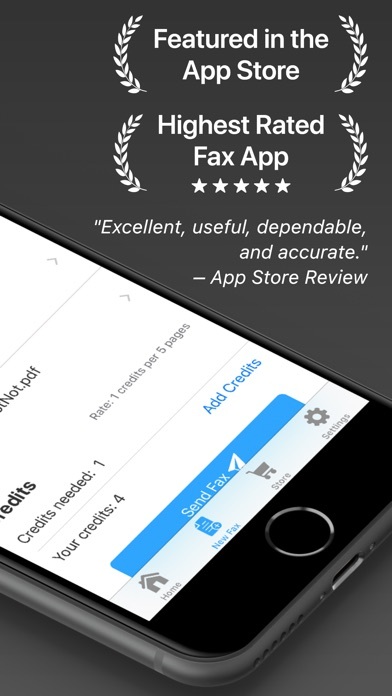 I looked at many other fax apps and they didn’t compare: the cost is reasonable and there is no monthly fee/subscription. You pay as you go. I’m glad I took the time to compare fax apps. I already have JotNot an I have faced with JotNot before now I have to download another app to fax this is dumb as hell.